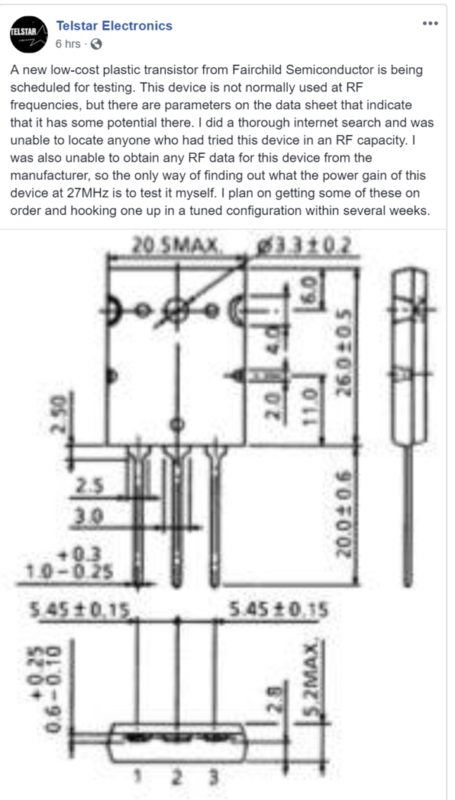 This landed in my inbox this morning about Telstar and yet another soon to fail amplifier adventure. Featuring his best pal from WWDX that tried to raise money on GoFundMe for snake oil modifications. I saw the post below but did not act on it because I did not know what it is about nor did I deem it newsworthy. Turns out, it IS newsworthy when people that know what he is posting tell me why it is. The device that is “scheduled” to be tested is a “TTC5200”. I wonder if he is scheduling a Satellite TV install where he tapes these transistors to the dish to get more watts? SEE! the builders didn’t think of that! Along with the image was a note to look at the age of this “new” part in an attached PDF that turned out to be the documentation for this “new” transistor. This might end up as the ERF9000! for all we know when the guy behind Palomar sees a way to profit from the average CB user…. it will come out…..
What you see in the image is a Toshiba specific package drawing. The Fairchild devices are physically close and will work but there are subtle differences that in inconsequential. He refers to it as being a Fairchild part (When Fairchild was rolled into ON Semi several years ago now) to throw people off. “new” parts would use the ON Semi branding. This component is actually a TTC5200 and it’s not a new part at all. Several people have already played around with the TTC5200 and it’s not a very good RF transistor unfortunately. Cheap, yes. A breakthrough? No. They are quite popular and easily obtained devices and used widely in audio amplifiers in a push pull configuration with the complimentary part. The PDF sent into the blog has a production date of March 2009. The part has been on the market 10 years old this month. Happy birthday Mr. TTC5200 transistor! The image Telstar posted also matched up pixel for pixel to the one in the document sent to me that was written by Toshiba. His image snip came from that document. What we see below is a comment from a whited out name telling everyone the part that he is talking about. What I am also told is that within a minute of that comment being posted it was removed. 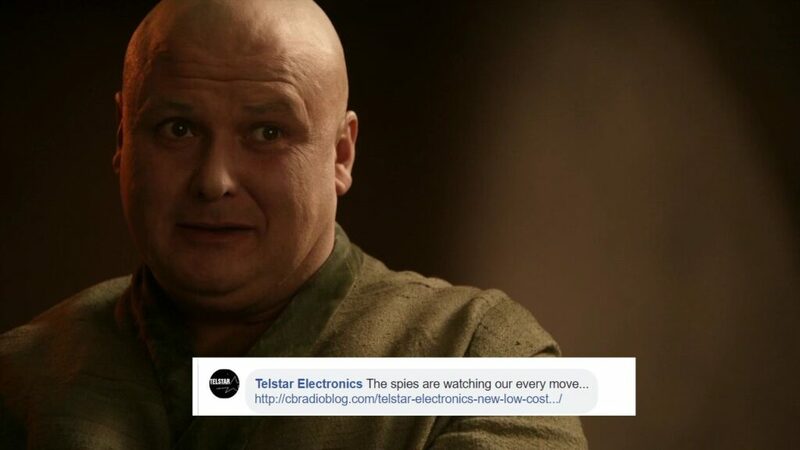 If it was not true I know Telstar would argue because he ALWAYS argues with posters and when he loses he deletes the thread and whines like a baby. 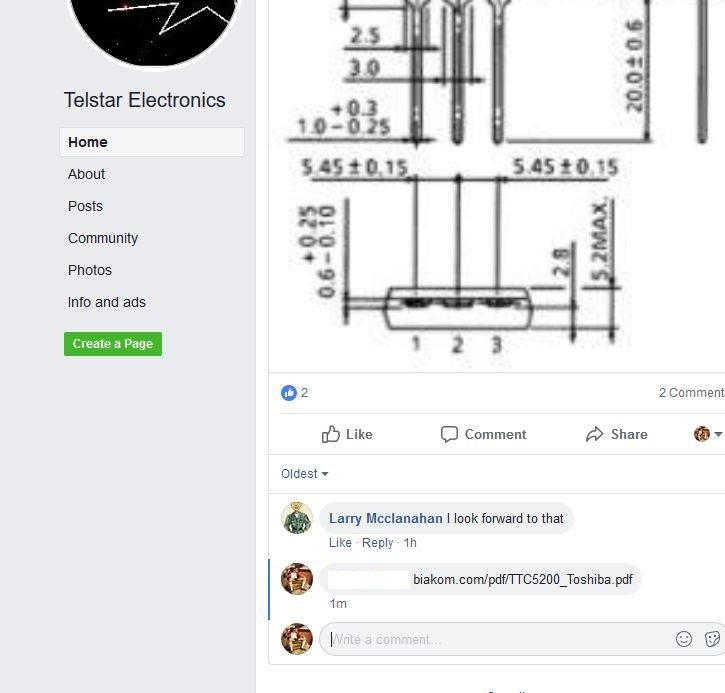 I know that Telstar will remove a comment like this with lightning speed because he doesn’t want anyone to know about his “new part” that is not so new. He deletes comments with great speed very frequently, because as a satellite TV installer he has plenty of time. Thanks for the tip! I almost let this one go past before Telstar deleted it like he does everything else to sucker punch the builders. He clears his Facebook page at least once, if not twice a day.